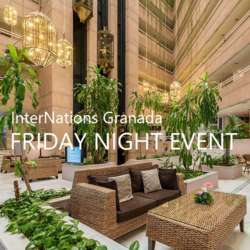 Reserve Friday, March 29th, to meet old and new friends, expats and global minds from all over the world in an exclusive hotel with our private space in Granada! This time, join us at Hotel Granada Center, one of the most beautiful hotels in the city with a great open space in the entrance hall, full of light and vegetation which makes it absolutely perfect for our international members. Don't hesitate to invite or come along with new friends, but please invite them to sing up for InterNations, too.